Farmers & Merchants Bank is proud to announce the addition of Nick Baird to its team in Kearney. Nick’s joined as senior vice president, office manager. His responsibilities include supporting the team and helping them continue to do the best job possible. As he settles in, he’s enjoying getting to know everyone at the Kearney location. Nick started his career in banking as a loan officer, where he helped countless customers realize their business dreams. 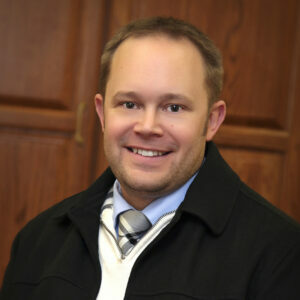 Prior to joining Farmers & Merchants Bank, Nick was chief financial officer at the Wyoming Department of Family Services, where he worked for four years. Nick has called Wyoming home for the better part of his life, but lived in Omaha when he was a young boy and has fond memories of his time there. He loves living in small towns with strong community presence, making Kearney a great fit for him and his family. He knew he wanted to join Farmers & Merchants after he learned about their community bank methodology. In Wyoming, Nick was involved in the community, serving on the board of the Community Mental Health Center. Now that he’s making Kearney his home, he is excited to learn about local nonprofits, roll up his sleeves and get down to work. Making the move with Nick are his wife, Audrey, and their five children, Trevor, Abigail, Carter, Tyson and Ashlyn. Farmers & Merchants Bank is a community-based bank dedicated to helping individuals, businesses and municipalities reach financial success by providing expert support and services. They serve Beaver Crossing, Firth, Jansen, Kearney, Lawrence, Milford, Palmyra, Panama, Superior, Weeping Water and Wilber.